Use goal-oriented techniques for successful family therapy with substance abusers! Family therapy is an essential core competency for substance-abuse counselors, according to the Substance Abuse and Mental Health Services Administration. 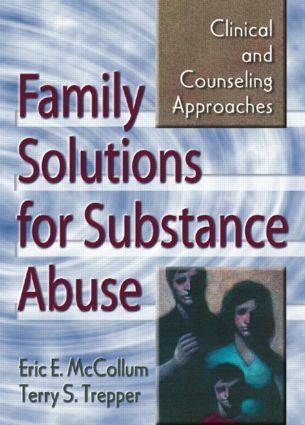 Family Solutions for Substance Abuse: Clinical and Counseling Approaches delivers the information and techniques you need to effectively treat addicts and their families. By understanding and changing the dynamics of the family system, you will be better able to guide your clients to adopt strategies and behaviors that sustain recovery and maintain healthy relationships. Family Solutions for Substance Abuse provides clear models of diagnosis and intervention for families, whether that means couples, teenagers and their parents, or Mom, Dad, and the kids. The theoretical background on family systems will help you understand the context of the client's addiction and the way it affects and is affected by other family members. Numerous case studies and figures bring the expert advice and theory into the practical realm so you can choose the best strategies for helping the shattered family heal. Treating addictions is notoriously difficult for even the most skilled therapist working with the most motivated client. Using the techniques in Family Solutions for Substance Abuse offers you and your clients a better chance at success, because addicts whose families share their treatment are much more likely to stay in counseling and remain clean and sober. Why Work with Families in Substance Abuse Treatment? Understanding the Family in Context: Family Systems Theory and Practice. What Makes a Difference in Treatment? Working with Families: Basic Skills. Assessing Motivation. Negotiating a Contract for Therapy. Problem and Solution Sequences. The Ups and Downs of Change. Ending Treatment. References. Index.